“Like the full moon.” So said countless companions describing the Beloved ﷺ. For under the harsh and relentless gaze of the desert Arabian sun, the moon is a welcome and glorious relief. It gifts a majestic, luminous light that guides us through the darknesses of our nights while captivating us with the face of its loving, radiant beauty. The moonstruck cannot look away. The moon reflects the sun. The Messenger ﷺ is al-Siraj al-Munir – a lamp radiating light. He reflects the beauty and majesty of the One who sent him. He ﷺis the messenger to us of Divine names and attributes most completely manifested at the level of creation. To behold him ﷺ is to witness the beauty and majesty oftawhid, or Allah’s unicity. The Shari‘ah (Islamic Law) is the law of that beauty and majesty – and nothing less. Within the letter of the law resides a spirit that awakens and stirs the heart to awe and joy, and leads us to the very Source of majesty and beauty. No detail of the law is without such spirit; and no detail of its practice should be spiritless – from canonical works to commerce, prayer to politics, remembrance to recreation. It is us who are our own deprivation: It is not the eyes that are blind, but the hearts that live in the chest. The generations of scholars who looked into the primary legal sources had minds that were sharper and keener than any of today and tomorrow, and they had hearts that saw realities beyond letter and form. When the overwhelming majority of them looked into the text of the Messenger ﷺ that commanded us to sight the moon, they did so with minds finely tuned to the rationalities of legal theory and semantics (usul al-fiqh) and the realization of benefit (maslaha) through the higher objectives of the law (maqasid). Their legal analysis flowed through hearts that were steeped in the certainty that the Messenger’s (sallalaho ‘alayhi wa sallam) words lead to ultimate happiness and good in the here and Hereafter. But for truth to be truly known, it must be experienced by the heart as well as the mind. Knowing the law and details of its deduction is not enough. So it was for me with the fiqhi issue of sighting the moon. Its true importance was only experienced during my stay with the Muslims of the Cape, in South Africa. Cape Muslims have an astonishing history rich with lessons for reflection. They were first forcibly brought to the Cape in the early 17th century by the Dutch colonialists as political exiles and slaves from the present Indonesian archipelago Islands. Their Muslim names were change and their identities were erased. From 1652 to 1795, Islam was not allowed to be propagated at the risk of forfeiting your property or death. During those desperate times, Muslims held to their faith through the teachings and living examples of a number of scholar-saints who were their exiled countrymen, and through communal gatherings of dhikr (Divine remembrance). “Amazingly, during this period Islam grew,” notes Cape Muslim historian Ebrahim Rhoda. Muslims in the Cape not only survived through Divine Grace but thrive today as a minority of less than two percent of the population. The circles of remembrance – which include recitation of Imam al-Haddad’s litany and the weekly celebration of the birth of the Messenger (Mawlid) – continue to this day and have become one of the defining features of Cape Malay culture and Islamic practice. 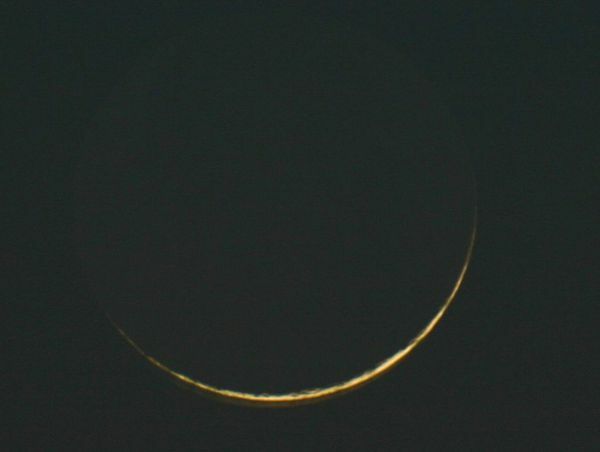 Among those practices is the sacred 350 year-old tradition of sighting the new crescent. The Society’s verdict, after consultation with other sighting bodies, not only heralds the formal beginning of the month of Ramadan but welcomes the month with a sacred spirit that is indescribable. As part of Cape Town’s tradition, individuals and families gather at Three Anchor Bay to sight both the Ramadan and ‘Eid crescent. The location is a prime-estate, upmarket suburb a stone’s throw from the city centre and connects to a promenade, always lively with city slickers walking, running and taking in the Atlantic seaboard. It is here that Cape Muslims gather in force to sight the moon. They have an iftar picnic and pray, in palpable anticipation for the delicate crescent to appear in the early twilight sky. And when it does – when it is seen floating in a sky above an endless horizon of ocean – there are ripples and waves of awe and jubilation. It is impossible to be unaffected. Those who are not present listen on the Cape’s Muslim radio station, which broadcasts live the entire episode of the sighting with commentators, guests, weather updates, the call to prayer, individual reflections, the final verdict and the tear-jerking nashids. The radio experience is similarly climactic. Even national media can’t help but be bound up in the entire affair: “Breaking news: Ramadan delayed to Wednesday,” went one headline on SABC, South Africa’s Broadcasting Corporation. As for when will ‘Eid fall, that is a natural uncertainty accepted by all South Africans alike – those at work, schools, government institutions – as part of the wax and wane of an established Cape Muslim tradition. The minority has made its mark by making an Islamic practice a culture, come ebb or flow. It’s a nuanced fiqh of minorities and everyone’s the better for it. For a Canadian with no sighting tradition that came to study in Cape Town, I first found the tradition melodramatic and mildly amusing. And why not? In many parts of Canada, our experience of the momentous entry of Ramadan is demoted down to a culture of complete dependence on a pronouncement – announcement, phone call, web statement – or worse, an advance year-before proclamation, that cannot compare in the slightest with the fresh elation born out of communal anticipation and, yes, uncertainty in seeing or not seeing the moon. In giving primacy to pure calculation in a bid to stave off uncertainty as we see it, reduce difficulty as we understand it, and integrate into a dominant culture as we perceive it, have we not lost the spirit of awe or joy intended by the words of the Messenger ﷺ? My wife’s eyes tear with talk of sighting the moon. My young daughters can’t wait for the thrill of it. My elder daughters feign a je-ne-sais-pas teenage indifference but the twinkle in their eyes tells another tale. I can’t believe how such a thin slice in space binds hearts together in such longing. These days, we can’t imagine a Ramadan without heading out to sight the moon. In previous years, we were among those that gathered off the Atlantic coast. Recently, we’ve taken coastal drives away from the city and even stopped to sight the crescent at our local stretch of beach. We park the car just before Maghrib and each one searches in secret competition to spot the crescent first, vying for the privilege to point it out to others, with the good hope of beating the radio announcer to Ramadan. O Allah, let it rise over us with goodness and faith, and peace and security and loving surrender. My Lord and yours is Allah. Allah, Allah! Blessed Ramadan, filled with awe and joy, my dearest brothers and sisters.